Today’s Zelda Fanart Spotlight is on Deviantart artist, zorn981’s Legend of Zelda fanart, ‘It’s Dangerous to Go Alone‘. 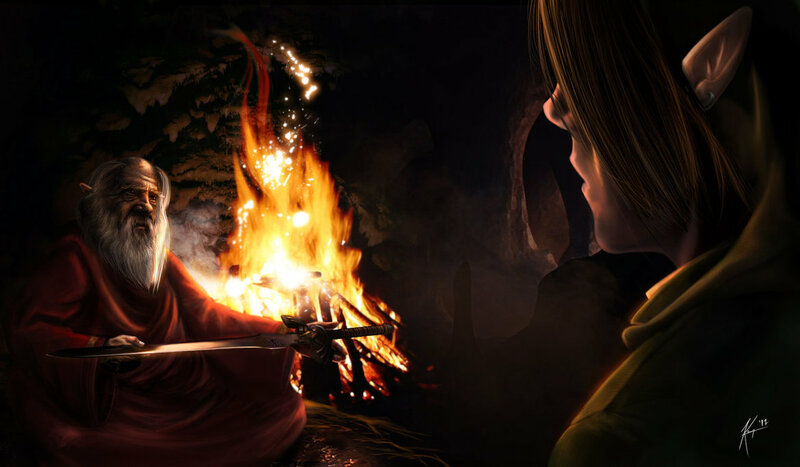 This fanart depicts the iconic scene of when Link encounters the old man in the cave shortly after the game begins. The old man, seeing that Link is without a proper weapon, gives him the Wooden Sword, or in this case, due to the artist’s choice, it’s the Master Sword. The colors and expressions that are used in this piece really help it to come alive. 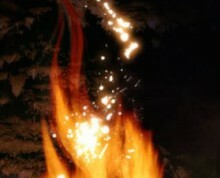 The light from the fire helps to give off a serious tone as well as sheds light on the feelings of the two people. The old man possess a sombre look upon his face. The reason for this sombre look may be because of his knowledge that Hyrule is a former shadow of itself and is overrun by monsters. One can also see the small spark of hope shining in his eyes in that he sees that there is someone who is willing to fight against these monsters and try to help restore Hyrule’s glory. Link possesses a look of awe on his face. Perhaps it’s from him realizing just how important this mission is to the old man as well as to the rest of Hyrule’s people. This certainly isn’t a mission that one needs to take lightly. I feel that this is an excellent representation of this iconic scene. I have yet to find another depiction of this scene that makes it come to life as good as this one does. Please go check out the artist’s gallery for other Zelda fanart related material. Be forewarned though, some of them are on the mature side. Also please let us know what you thought of this epic fanart by leaving your thoughts in the comments section below. Stay tuned for the next Zelda Fanart Spotlight! Until then!